The UN Paris Agreement on climate change aims to ensure increases in global temperature are less than 2°C above ‘pre-industrial’ levels, with an aspirational 1.5°C limit. However, the ‘starting line’ of the pre-industrial era is not defined by the UN agreements, or by the Intergovernmental Panel on Climate Change (IPCC). A new analysis by an international team of researchers aims to better define the pre-industrial baseline, informing the world’s decision makers on the required limits to greenhouse gas emissions needed to meet the terms of the Paris agreement. The study concludes that 2015 was likely the first time in recorded history that global temperatures were more than 1°C above pre-industrial levels. The invention of an efficient steam engine by James Watt in 1784 meant humans were able to effectively convert fossil fuels into energy, a process that releases carbon dioxide (CO2) into the atmosphere. [Though coal was being burnt for industry before then too]. As the industrial revolution gathered pace in the 19th century, the resulting increase in CO2 and other greenhouse gases from land-use change and fossil fuel burning started to warm the Earth. To better define the Paris Agreement’s commitments, we need to select a suitable starting point for when humans began to influence the climate. However, there is no perfect choice. 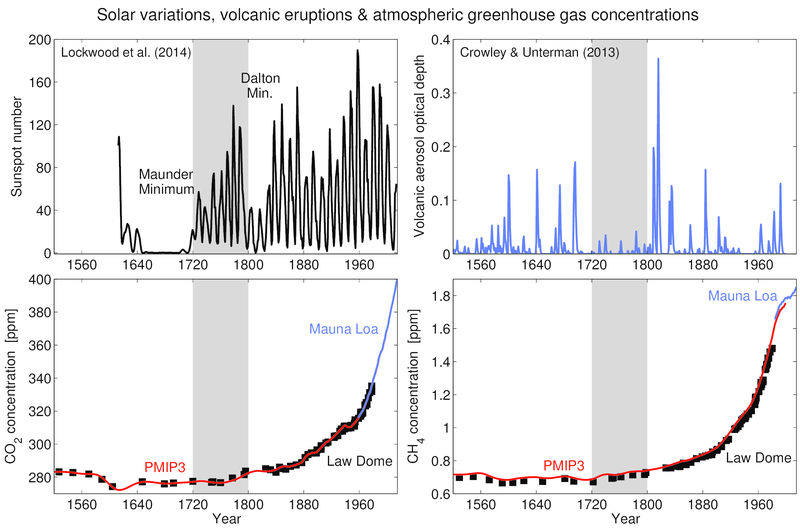 Previously, the period 1850-1900 has been used as the historical baseline, but this period includes some large volcanic eruptions and is after greenhouse gas concentrations had already started to rise. We suggest that the earlier period of 1720-1800 is a better choice for this baseline. This is because the major natural factors that also affect Earth’s climate – the levels of solar and volcanic activity – were both at similar levels to today (see Figure 1). This is important because we want to assess the changes due to human activity, rather than changes because of other factors. 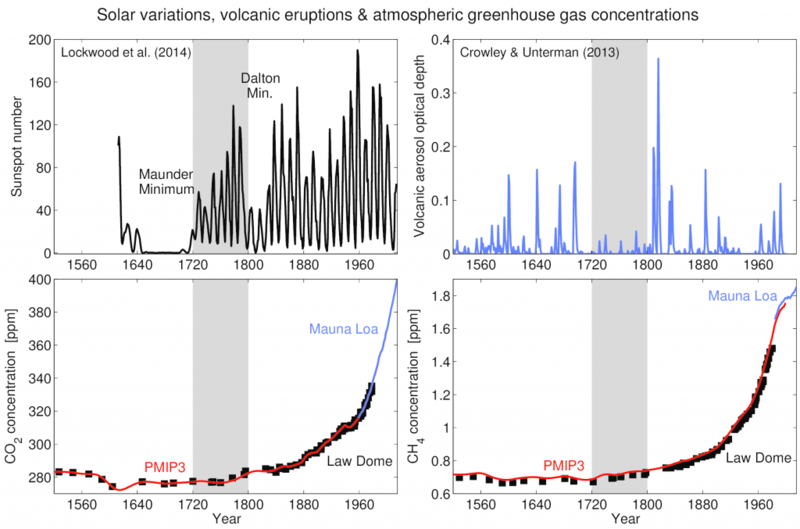 For example, the early 1800s were cooled by several large volcanic eruptions and so are unsuitable for a baseline. And before 1720 there was less solar activity and also several large volcanic eruptions. Figure 1: Historical changes in different climate forcings. Top left: sunspot number as a proxy for solar activity. Top right: estimated volcanic activity from ice core data. Bottom: carbon dioxide and methane concentrations. The grey regions indicatie the selected period to represent ‘pre-industrial’. So, by how much have global temperatures changed since pre-industrial? A problem with our chosen pre-industrial period is the limited availability of observed temperature records. We can make an assessment of changes in global temperature since the 1720-1800 period, but the uncertainties are quite large. In our study, we considered the long temperature records that do exist for central England, the Netherlands and Europe, as well as our understanding of historical changes in factors such as greenhouse gases, the sun and volcanic eruptions. We assessed that global temperatures likely increased by more than 0.6°C from the pre-industrial period up to 1986-2005. This means that the year 2015 was at least 1°C warmer than the pre-industrial era and 2016 was likely to be more than 1.1°C warmer (see Figure 2). 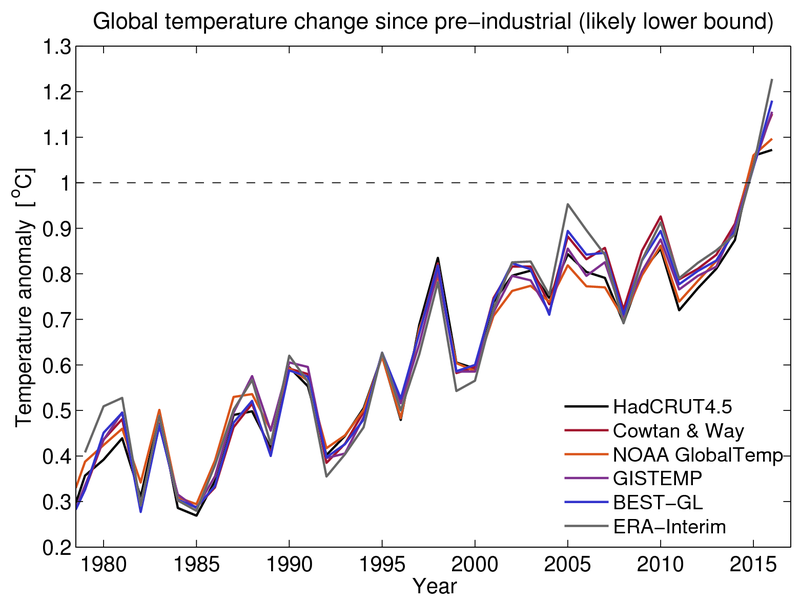 Figure 2: Global temperature changes from multiple datasets, presented as the lower bound on warming since the pre-industrial era. Updated from Hawkins et al. with the 2016 global temperature data. What does this mean for the Paris agreement? Now we are able to define the starting line for the global temperature limits stated in the Paris agreement, we can also better define the finishing line. The IPCC 5th Assessment Report used 1850-1900 as a historical baseline (but did not formally define this as ‘pre-industrial’), and estimated the warming from then to 1986-2005 at 0.61°C. The new analysis finds that this historical warming assumed by the IPCC is at the lower limit of what we assess is the true change since pre-industrial times. There is also more to learn. We need volunteers to help rescue additional observations of climate from various undigitised sources to better understand the climate of the 19th century. The suggested 1720-1800 period also offers a target to paleoclimate reconstructions to inform this topic. The study also suggests that policymakers might avoid the inevitable uncertainty in defining pre-industrial by reframing the temperature limits in terms of a more modern baseline. For example, 2°C above the pre-industrial era might be translated into X°C above 1986-2005 (or another modern baseline). This would allow use of better observations and atmospheric reanalyses to define the starting point, but would require more thought into what X should be. It would also better inform the difficult decisions about how much greenhouse gas emissions would need to be reduced to avoid breaching agreed global temperature thresholds. A few points. First Paris was negotiated with the assumption of 1850 to 1900 setting the preindustral baseline. You appear to be indulging in the well known Climate ball sport of moving the baseline. Second most of the human forcing btw 1800 and 1900 was land use change even in the UK with the Enclosures Acts so using a pre 1800 baseline mixes effects of land use with geenhouse gaseso. Thanks Eli – our paper suggests there was some additional warming pre-1850 due to human activity which was not accounted for by the Paris agreement. Also, HadCRUT4 (used by AR5) is at the lower end of the 1850-1900 estimates now we have updated global datasets (Cowtan & Way, Berkeley) for that period. Have tweaked the post to mention land-use explicitly change as I agree that is very important – but this is still human activity and would expect to be included in any assessment of our effects? Eli, I wasn’t present during the Paris negotiations so I’m unsure about your statement that it was negotiated with the assumption that 1850-1900 = preindustrial. Do you have evidence for this, e.g. a statement from the agreed text or supporting documents? I *was* present at the plenary session where Working Group I’s contribution to IPCC AR5 was approved, line-by-line. There was certainly *not* agreement by all government delegates to the suggestion that 1850-1900 be used to represent preindustrial levels and as a result the term preindustrial was replaced by the more accurate/direct 1850-1900 where the latter had been used. I was also called to the podium and asked for a scientific assessment of the difference in global temperature between 1850-1900 and preindustrial — something which I was unable to do on the spot, but which the current work is now an attempt to do. Tim Osborn, do you know why the IPCC WGI Glossary defines “pre-industrial” as prior to 1750? Brandon, that is based on a literal interpretation that the industrial revolution began around 1750 (give or take: https://en.wikipedia.org/wiki/Industrial_Revolution) and therefore everything before 1750 is “pre-industrial”. Two problems here: (1) that doesn’t give a starting point for the period only an end point. Where should we start? 1500? Medieval times? Last glacial maximum? Formation of the Earth? (2) We need to actually get a useful estimate of the temperature of the baseline, otherwise the baseline is pointless. So, we also consider pragmatic reasons for not using an earlier period with even poorer data. In this report the terms preindustrial and industrial refer, somewhat arbitrarily, to the periods before and after 1750, respectively. I’ve confirmed that’s included in the glossary of the WGI, WGII and WGIII reports. That means each report explicitly identifies pre-1750 as “pre-industrial.” If the IPCC uses other definitions throughout its reports, it would seem we’d need an explanation for the contradiction. I have to ask, how do you justify changing the temperature baseline being used after a deal has been negotiated? While i think defining the “pre-industrial” time period and temperature/greenhouse gas/etc. baselines is a good thing to do, it is something which should have been done ages ago. It certainly isn’t something which should be done only after people reach an agreement, as a way to change the nature of the agreement people signed onto. Part of the reason I ask this question is from a legal perspective, this would never fly. The Paris Agreement was negotiated with an idea of what “pre-industrial” meant. Even if people decide they’d rather “pre-industrial” mean something else, that desire does not change the terms of the agreement. Attempting to change the baselines used for an agreement after the agreement has been negotiated and ratified in order to force people to do things they didn’t agree to is not okay. Personally, I don’t see how anyone could trust this approach to negotiating deals. If neither the Paris Agreement nor the IPCC defines “pre-industrial,” then the agreement is basically meaningless. It certainly can’t be based on science if it’s basically just pulling numbers out of thin air. It’s certainly not just pulling numbers out of thin air, and I am sure the policymakers had a good idea of what they meant by ‘pre-industrial’! There are many (scientific) details which are not explicitly defined within the Paris agreement and, of course, more evidence accumulates to improve our understanding of historical temperature variations so our estimates of the amount of observed warming are refined over time – it can never be a completely fixed target anyway. Ed Hawkins, if you negotiate a deal then only later work out what the terms of the deal actually are, that is… highly questionable. If there are many different choices as to what “pre-industrial” might mean, then the agreement’s use of specific numbers has no basis. Different parties to the negotiations may well have had different ideas as to what they were agreeing upon in such a scenario. That means the numbers agreed upon wouldn’t be based upon any actual scientific agreement. As far as science is concerned, the numbers are effectively picked out of thin air. In any event, the IPCC AR5 explicitly defines “pre-industrial” as prior to 1750 in its glossary. I don’t know why you don’t mention this in your post or paper. I also don’t know if the term is used differently in other parts of the report. 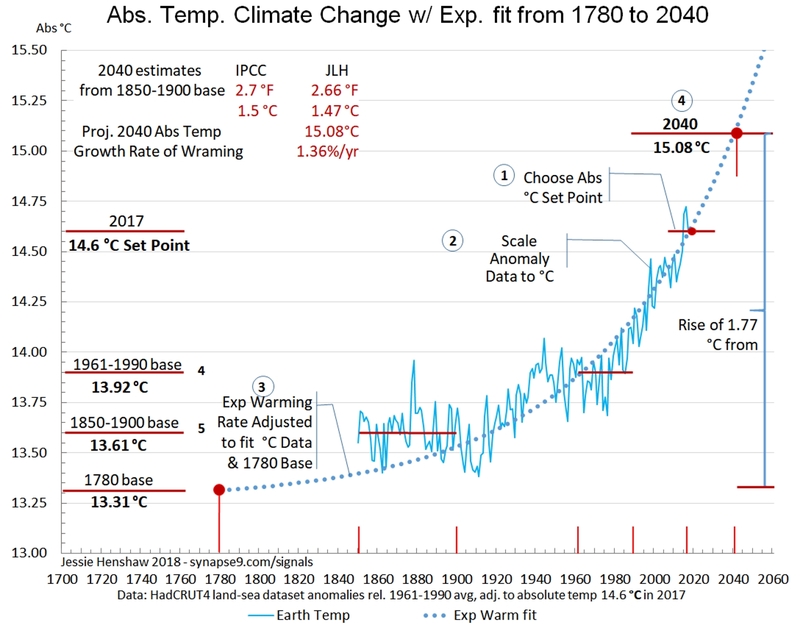 Regardless, I would think it provides prima facie evidence the Paris Agreement should be understood to be based upon pre-1750 baselines. I’d imagine one could get a better idea by examining the actual negotiations to see what topics were discussed, as it is likely the choice of baseline did come up during negotiations. What I don’t see is how any group of scientists could, after the fact, decide what people who negotiated a deal meant by their deal based upon a novel scientific analysis. That’s why I asked you how you justify your decision. To repeat the point, I do not see how you justify saying your conclusion here as to what “pre-industrial” means is what the Paris Agreement should be understood to mean. Could you explain? To also repeat myself, I have nothing against trying to determine what should be considered “pre-industrial.” I think working at resolving that question is good. I just don’t see how one justifies applying any such decision to a negotiated deal after-the-fact. Hi Brandon – the paper very clearly says the forcings are defined relative to 1750, but that ‘pre-industrial’ is used to mean different things in different places in AR5. I would love to know what was discussed during the negotiations but note that the use of ‘2C above pre-industrial’ in UNFCCC documents predates the Paris Agreement and AR5 by several years. Also, we don’t claim in the paper to say that this new definition is how the Paris Agreement should be interpreted – in fact, we suggest in the final paragraph that UNFCCC shouldn’t use pre-industrial! I’m afraid what you say here seems misleading to me, but I can’t seem to explain why as when I try, I’m told my comment has been blocked for security reasons. I don’t even know if this comment will go through. In case this one does show up, I should mention one thing. Your response here says your paper doesn’t attempt to (re-)define the goals of the Paris Agreement, which may be true. Your blog post, however, explicitly ties the analysis in your paper to (re-)defining the goals of the Paris Agreement. Telling a person what they say is not true of your paper is unhelpful when it is true of your description of your paper. If you don’t want people to say something about your work, you shouldn’t say it yourself. We had a climate conference in 2016 in Marakesh to make several points of the Paris agreement more precise. How emissions are defined and will be monitored, for example. They helped some in free climate data so that the temperature increase can be better monitored. That is why there are yearly conferences. That is completely normal. It is (nearly?) always the case that when politicians decide on the main lines of a treaty that afterwards diplomats keep in touch and fill in the details to be decided in a next meeting. How the 2°C limit should be tracked is one of these things the politicians need to make more precise. This paper helps/informs them in their discussions. There will be more papers on the topics and the politicians are free to decide how they want to interpret it. Could even be 2°C since 1990. I personally hope not, but they can. Is the period explicitly defined in the Paris agreement? I was looking for this the other day, but to no avail. I’m a semi-pro in this field: understanding and communicating climate change is part of my job but not all of it; I need to be conversant in the science even if I’m not producing any of it. This is an example of an issue where clarity and consistency would certainly be welcome. OK – I’ve read the abstract which answers my first question. I disagree with Brandon’s view that it render Paris meaningless – the purpose of the agreement is unchanged – but that definitional clarity would be good. Thanks Dan – yes, the full paper discusses a lot of the detail of your questions and is open access for anyone to read! The introductory sections are (hopefully) quite readable. Clarity is what we are after! Since it is difficult for a non-expert to line up the various baselines to compare and contrast climate metrics, would also like to see more climate-related technical analysis use one baseline: temperature and other data series, modeling, paleo, etc. Perhaps this effort will help lead in that direction. There’s an obvious question here that I don’t think has been answered. How large? The abstract of the paper seems to suggest about 0.25C, but that seems optimistic. Obviously, the further back you go the bigger your error bars get, which is an argument against going so far back. Yes, I agree the further back you go, the larger the errors get. This is one reason why we argue for referencing such agreed limits to global temperature from a modern, well defined baseline instead. The quoted 0.25C range is an (expert judgement) assessed ‘likely’ (66% probability) range as we didn’t consider we could reliably assess, say, a 5-95% range. I think this is reasonable. A nice, well-argued paper, by the way. I suspect that as GCMs and our knowledge of past forcings continue to improve and as an increasing number of temperature proxies from the relatively recent past (1700-1850) are added from around the globe that we will see improved calibration of the sparse and somewhat problematic early instrumental temperature record with natural proxies. Call it consilience, at the risk of overusing that useful term. Great article. I do have a stupid question though I’m not a climate scientist. Is there a simple value that I can use to adjust the baseline period for two widely available temperature datasets such as GISTEMP or NOAA GlobalTemp so that I can adjust their respective baseline periods to match your paper’s pre-industrial baseline? Figure 2 in the post above does this – you need to subtract the mean of 1986-2005 from each year in your chosen dataset and add 0.6K. I’m aware that the 2K-goal was defined as the warmest temperature we have seen during the ( geological) shorter past. Perhaps it could be the GMST during the LIG because we can conclude that there was not an apocalypse( just because we exist to make this thoughts). So it seems to be very important to define a well grounded baseline. This was known since Nordhaus (1977) made the first attempts to define an upper limit of warming. In this light the paper (and this blogpost) is IMO a very valuable (and overdue) contribution. Thanks! As i see the situation as a complete none educated lay person. Take 1750 take 1880 to me use both or if one was to use the BP date of 1950 that is defined Before Present because that is before we used atomic bomb testing and messed up the carbon dating information. The simple fact is regardless of which, every exact or 10 year or 30 year average you use look at the data. It shows with out a doubt that there has been a significant change to earth. Evidence ocean temperature, ice mass, glaciers and it does not which set of figures one uses but an every increase in temperature measurements. We have a problem every one with half a brain knows that pleaseeeeeeeeee do not get bogged down it petty detail. Obviously not a baseball fan. A ‘player to be named later’ and ‘future considerations’ are a staple of many baseball trades. General managers, much like diplomats, have ongoing relationships with their peers. There have a vested interest in their reputation. Reneging on an outlined deal would be counter-productive. IPCC AR5 (WG1 report), Figure 12.40 (page 1100) indicates a difference between “pre-industrial” temperatures and the 1980-1999 Reference Period (non-standard, only 20 years long instead of the usual 30) of EXACTLY 0.5°C. Note that “pre-industrial” means different things to different IPCC Chapter Lead Authors. Ed: I can suggest many reasons why defining “pre-industrial” temperature as 1720-1800 land instrumental temperature could be a poor choice. 1) The 95% ci for BEST 1750-1800 is +/- 1.5K, so instrumental land temperature is highly uncertain during your period. We didn’t learn how to “properly” measure air temperature using thermometers in screened, ventilated enclosures isolated from sources of heat and cold for another century. Some CET data for your period, for example, was recorded indoors (Wikipedia). Using 1850-1900 corrected for GHG and other forcing (only 0.00-0.06 K according to GCMs if I understood your paper correctly) appears to involve much less uncertainty. 2) You appear to have ignored any “committed” cooling associated with the preceding century of low solar activity (MM), which did fully rebound until about 1750. 3) Homogeneous Millennial temperature records (ice and ocean sediment cores) show that your chosen period is the among the coldest in the last few millennia of “pre-industrial” climate. Looking a millennial or multi-millennial “pre-industrial period” averages out the influence of natural AND unforced variability and appears to fit 1850-1900 better than 1720-1800. 4). Instead of a cold period, how about as choosing the Holocene Climate Optimum (with a green Sahara) as an example of a good “pre-industrial” climate? An absurd suggestion, but picking the coldest possible period is also absurd. I think the idea to define the “preindustrial” to the time before 1750 is a good choice, as the CO2 level icreased more markedly from that time. But the temperatures of that time will have some uncertainties. The assumption that changes in air temperatures is driven by GHGs from preindustrial seems not reasonable. For some hundred years it seems that the oceans were cooling, and from ca 1700 the undercooled water was taking up energy from the sun again. As is shown in a tiny sea level rise in the 18th century. So it had to restore a new equilibrium for the next centuries. Air temperatures will always follow ocean. And much of the temperature rise has been good for the human race. I think it is impossible to know how much of the temperature increase is manmade and how much is natural variations. But I think that the longer natural variations are underestimated. And it is a question if this natural warming of oceans has stopped now after 300 years. It is also clear that models can say very little of global warming, as they are not able to hindcast deep ocean temperatures the last 150 years. To define 1750 as the beginning of industrial age will just be a convention, something to agree on. It is a good point that much of the forcings of 1750 are similar to the state today, as solar forcings. I am more uncertain with volcanic eruptions, as 18th century was more quiet than usual. If 1750 was chosen it would be natural to use 60 years mean from 1720 to 1780 as a baseline, as 60 years is a known climate cycle. It would also be necessary to have some consensus on best temperature estimate, not as a scientific fact, but more as a convention. But as such it is meaningless to set some clear limits on air temperature rise, as it is too much uncertainty with 1750 mean temperature, and there is little certain knowledge what temperature change is beneficial, and what temperature rise lead to some accelleration of sea level and other disadvantageous consequenses. Thanks for the article Ed! I am not an expert on this but am doing my best to grasp it fully. I have a few questions I’m hoping someone might be able to help with – particularly #3. 1. Is it fair to say that 1850-1900 is the generally accepted baseline used by the IPCC, even though they define pre-industrial as before 1750? 2. Did the Paris accord really not set an actual baseline and instead let “pre-industrial” be open to interpretation? *3. What was the actual mean temperature for the 1850-1900 period in celsius? And what was it for 1720-1800? 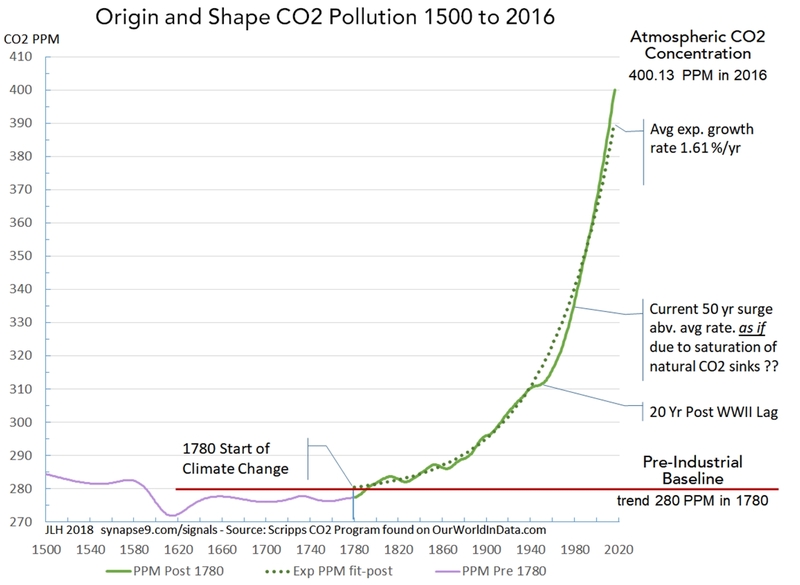 Hi Ryan – the answer to the first two questions is ‘Yes’, although the 1850-1900 baseline is not actually called ‘pre-industrial’ in the final IPCC report. The third question is harder – we don’t tend to estimate the absolute temperature because it is actually very hard to define. We think that we are close to 14.5C at the moment but that comes with considerable uncertainty. The reason it’s so hard to define is that temperature varies on very small spatial scales. Temperature changes are easier as they vary over much larger spatial scales. Thanks for the quick response Ed – very helpful overall. I’m still a little confused though – apologies. Are you saying we don’t tend to estimate average temperature today because of the variance on small spatial scales? If so, understood. I’m still curious about what the average temperatures were in 1850-1900 and 1720-1800 though as an absolute number in Celsius. We know and use those right? If so do you know what they are or point me in the right direction? Hi Ryan – yes, it is hard to estimate absolute global temperature from observations because of the variance on small spatial scales. That also applies to the pre-industrial period – we can estimate the change since then pretty well, but can’t estimate the absolute temperature with any confidence. Oh, interesting. Okay, thanks for the help and speedy response Ed! Ryan’s 3rd questions about a quantitative value for the pre-industrial global avg temperature is exactly the information I have been trying to find. Thank you for clarifying Ed. However, pardon my dumb question, but how can the IPCC say the goal is to keep the average global temp below 2 degrees C above pre-industrial levels, when they don’t even know what the pre-industrial level is (or the time-frame for that matter)?? So how do you gage if this is being met? Luckily all this arguing about the proper baseline for pre-industrial should be rendered unnecessary by the naturally enhanced AGW by the year 2050, when it’s clear that the decision to remove solar panel off white house roof was the start of it all. For real, this sounds like a good job. I’d have no trouble to call 1850-1900 the preindustrial, as the things that matter wrt sea-level rise and crop production are the absolute temperatures and the radiative balance between surface and space. Thanks for the question. Firstly, it is the UN climate negotiation process that decided on the 2C limit, rather than the IPCC itself – the IPCC only provides evidence, it doesn’t make policy decisions. When looking at how temperature has changed, then the process is as follows: (1) collect together all the available long temperature measurements. (2) For each location, calculate the change in temperature relative to a reference period (normally 1961-1990). (3) Add together all the changes in temperature from the various locations. This means the change in temperature is calculated without needing to know the absolute temperature of the whole globe. (4) The total change from pre-industrial to present can then be calculated. Just make it simple and put 1750 or any other year that is a good baseline for any human made changes. Let’s just say 1750 and then we may all put our datasets to be compared to that year. It is obious that certain or in some cases all studies uses starting point that is suitable for them. For public it is extremely hard to follow temperature change if you don’t have stable starting point for all public announcements. I’m tired to see politics on something simple as single starting point of temperature. It doesn’t matter even if we make starting point at year 2018, but then we have to change our talk corresponding to that fact. Like: we can only raise temp +1C from 2018 to 2100 to get all things that previously meant change for +2C pre-industrial world. But if we can’t even make single temperature starting point, then how can we ever get our fossil fuel usage to 0 (we need it before 2050!!! Permafrost melt and we are not making it easy!) before all natural limits are busted? Yea, we are still going towards +3C world with over 1,5m sea level rise, few billion refugees (who is the 1st one who shoots them on border?) and hard farming conditions (locally we are experiencing 3rd bad year in a row and we have to buy our food from global market). Ed, I do appreciate the hesitation to give a specific temperature to the earth given how the heat moves around in quite unpredictable ways. We overcome that by using baseline periods, but the contradiction is that everyone states anomalies with precision and no one measures the temperature difference between the baselines baselines. So I think there’s a real need for someone to state the “virtual absolute” temperatures of the baselines. It’s that I get data from one source or another and it’s never comparable. I also found a really nice and seemingly useful way of projecting backward in history to find the earth’s average temperature when the growth of CO2 pollution was first noticeable in the data, 1780. Since the drivers of climate change are the economy and CO2, and both present smooth exponential curves over long periods of time, one can surmise that the irregular variations in warming are entirely caused by the evasiveness of the climate and the difficulty measuring it. What that allows is a theoretical basis for fitting an exponential curve anchored at 1780 to the warming anomaly data, to be read with a full appreciation of the variability of the underlying systems. I did that and wrote it up (at the top of my research notes site) before I realized I couldn’t calibrate my data for 1961-90 average temperature anomalies it recorded. I’m so disappointed. I need to be able to convert my projections from the 1961-90 format to absolute and then to 1850 to 1900 format. Do you know where I can find the baseline temperature for the 1961-90 anomaly data? Ed, Thanks. My method of analysis is aimed at displaying the behavior of the systems in a way that better communicates what’s really happening. I think that’s something we haven’t well enough with the general public, and part of why so many people don’t understand what’s happening. I[d be pleased to see what you think. Using my method I define a set point for the HadCRUT4 data set (2017-14.6C) and find the 1961-90 baseline to be centered on 13.9 C and the 1850-1900 on 13.59. I know these are all uncertain, but still letting me fairly precisely determine the 2040 temperature relative to the 1850-1900 average, closely matching the IPCC estimate. What I do is project the growth trend of warming from the 1780 emergence of noticeable industrial CO2 emissions based on the growth coupling of atmospheric CO2 and CO2 emissions. To me that’s all preliminary to making the displayed dynamics believable, and asking what they mean. I’d be glad to see what you think.